Alex Gulko is an experienced craftsman and jewelry designer who transforms your personal style into wearable art. 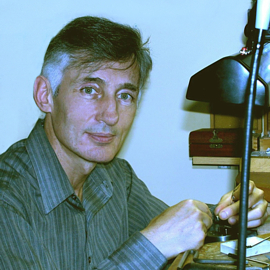 Ukrainian born, he began making jewelry as an apprentice to a jeweler whose father worked for the fabled Faberge atelier. Alex attained the professional rank of Master of the Union of Artists of the USSR through participation in Ukrainian and international exhibitions. The Ukrainian Museum of Historical Treasure has also honored Alex by procuring several of pieces of his jewelry for preservation. As an experienced craftsman, Alex's tremendous attention to detail and quality consistently produces timeless and elegant jewelry. His design bears the hallmark of a historical perspective. Pieces range in style from Art Nouveau, Art Deco to his personal contemporary design, which uses geometric planes and open architectural elements. Alex believes being able to design well-crafted pieces from a variety of styles makes him a more versatile and better able to meet the diverse tastes of his clientele. Come to his workshop and design your own jewelry. It will be a very exciting and satisfying process. Alex begins by discerning your style using specific techniques developed through years of experience of designing. This stage is absolutely crucial to the design process. Then Alex draws a detailed sketch and works with you to select the perfect compliment of stones and metal to enhance your piece. Once the design has met with your approval, Alex creates a wax model from which he then crafts your unique piece of jewelry.